A serving of cooked fresh tuna is low in saturated fat and cholesterol, high in protein and rich in nutrients like selenium, vitamin B-12, vitamin B-6 and niacin. It is also a good source of omega-3 fatty acids, providing more per serving than cod, tilapia or catfish. 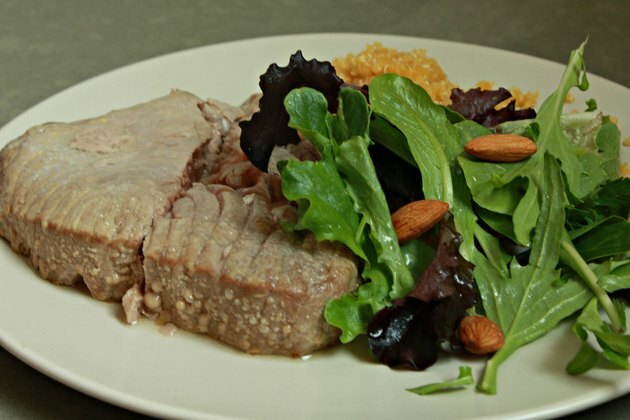 A typical tuna steak cooks in less than 15 minutes and can be prepared in a variety of ways, including in the oven. Whenever possible, choose fresh yellowfin, bigeye or albacore tuna that has been caught in the United States or skipjack tuna that has been troll- or pole-caught in any ocean. According to the Monterey Bay Aquarium Seafood Watch, these types of tuna are caught in environmentally responsible ways. 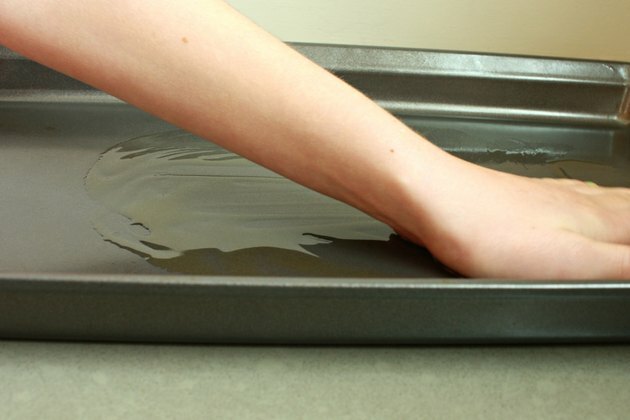 Coat a rimmed baking sheet with cooking spray or a thin layer of olive oil. 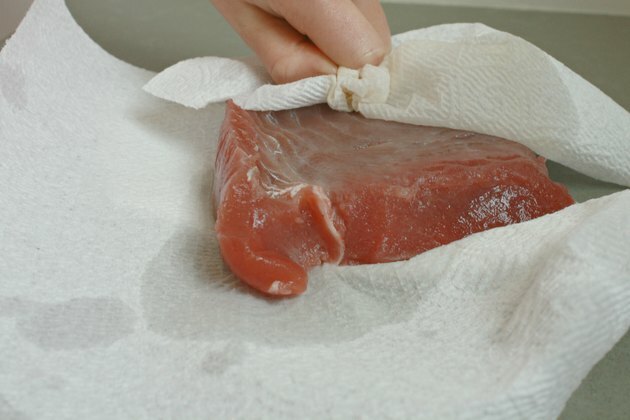 Pat each tuna steak dry with paper towels. Use a ruler to determine the thickness of the steaks. Arrange the fish on the baking sheet. Brush each steak with olive oil and season them with salt, pepper and your choice of spices and herbs, such as freshly minced rosemary. 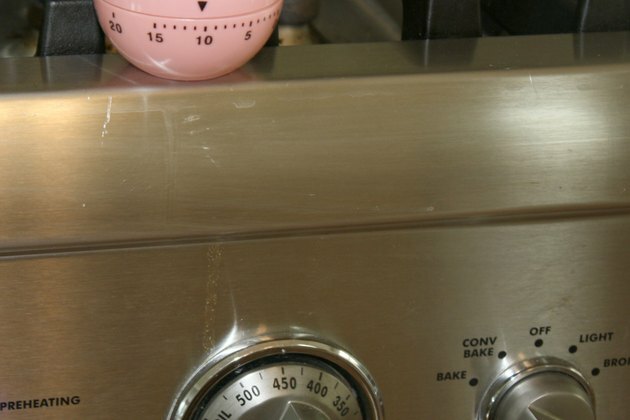 Preheat the oven to 450 degrees Fahrenheit. 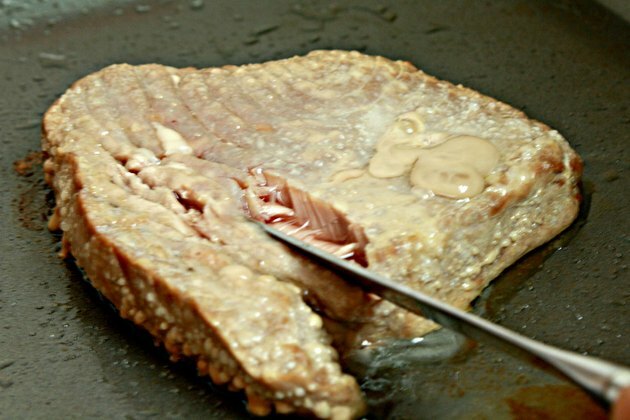 Bake the tuna steaks for approximately 10 to 12 minutes per inch of thickness. Instead of brushing the tuna with olive oil before baking, marinate the fish in your choice of marinade for 15 minutes to four hours prior to cooking. According to the Natural Resources Defense Council, pregnant or nursing women, women who may become pregnant and young children should eat skipjack tuna no more than six times per month and yellowfin or albacore tuna no more than three times monthly to avoid excess mercury consumption. These groups should not consume bigeye or ahi tuna, both of which contain a high concentration of mercury. Avoid overcooking fresh tuna. The fish will become dry and chewy if you cook it until the center is no longer pink. 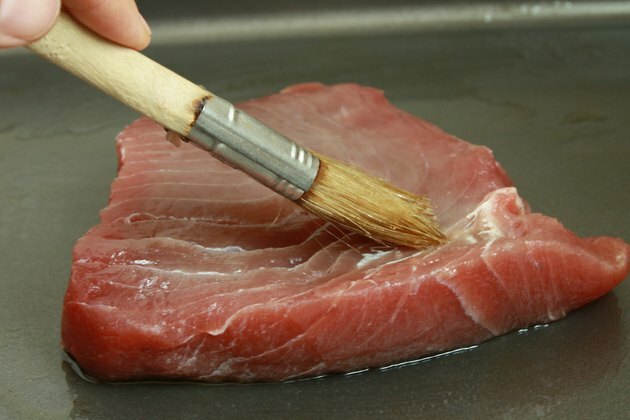 For the best results, the inside of tuna should be red or pink when served.